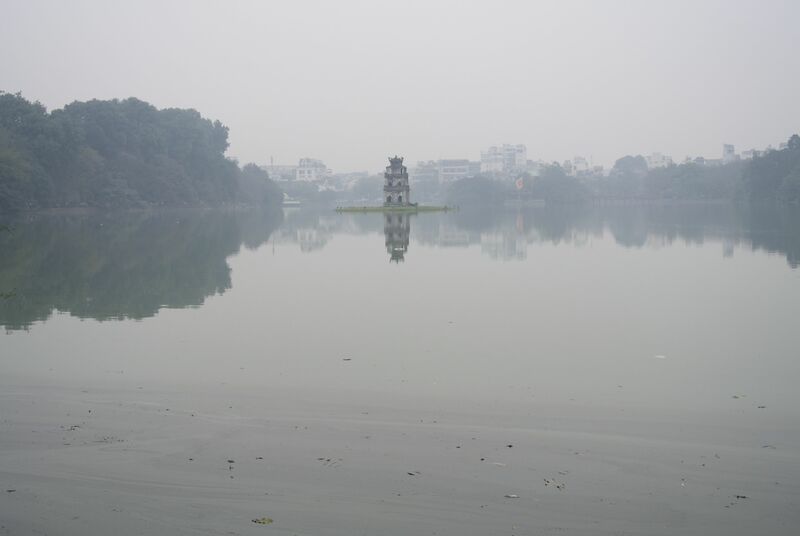 Hoan Kiem Lake in the center of Hanoi. It’s certainly the strangest museum I’ve ever been to. I know beforehand that there will be a healthy portion of propaganda and I had seen the cult of personality still being pursued by the government, but I feel like I’m missing something at the Ho Chi Minh Museum in Hanoi, Vietnam. The museum is adjacent to Uncle Ho’s enormous mausoleum. As I approach, a woman is taking a selfie with it in the background. The first floor of the museum is your standard fare of charts, graphs, and photos elucidating the triumph of socialism in Vietnam, spearheaded by Ho Chi Minh, fierce proponent of a free and prosperous Fatherland. The presentation of Vietnam’s rise as a “communist” country is convoluted by the many references to Foreign Direct Investment and policies decidedly capitalistic. But the real fun is on the upper floor. 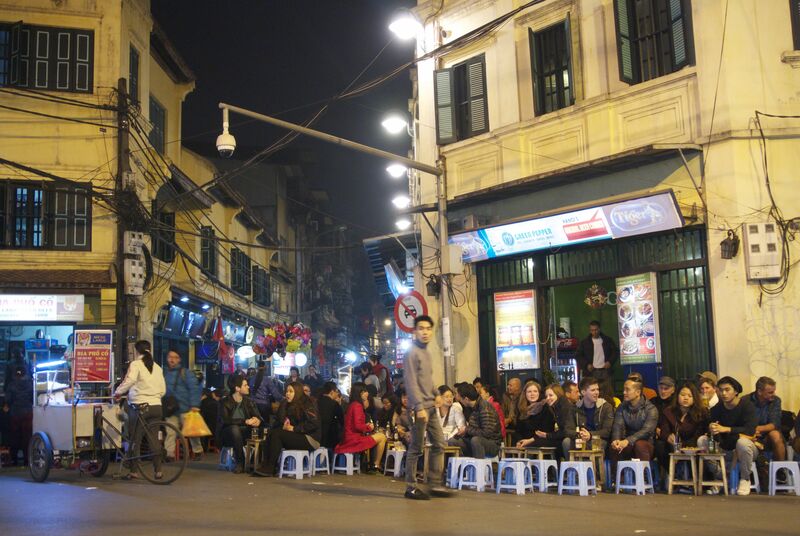 A mix of foreigners and locals showing foreigners around at the corner of Ta Hien Alley drinking beer on plastic stools. It’s disorienting, walking through exhibits showing former possessions of Uncle Ho, many many letters that he wrote (not translated from the Vietnamese), videos of important events, and a number of conceptual art renditions. One such section is called “Guernica” and features renderings of art from the time of Picasso’s painting about the Spanish Civil War. Another slightly more relevant exhibit is Soviet inspired. A small placard explains the intent of the exhibits, which seems a misguided effort of reconciling socialist realism and abstract representation. Hanoi could not be more different from Saigon. Where Saigon seems to be a powerhouse of consumerism and tall shiny buildings, Hanoi looks like it hasn’t changed all that much in a long time. Walking through Old Town’s winding streets down to Hoan Kiem Lake under the overcast sky of Hanoi is ethereal. The weather is colder and the dress less casual. I put on a proper pair of shoes for the first time in a while and am approached by a shoeshine constantly. Something about Hanoi feels uncannily familiar, while at the same time distinctly and impenetrably Vietnamese. I feel at home and completely lost. I only have a couple days in Hanoi as my trip reaches its terminus. I don’t know where to go outside of the typical areas. I wander the streets of Old Town, past countless stalls selling things for the Tet holiday, past the rows of backpacker hostels and bars, to streets lined with produce being sold from the sidewalk, and corner joints packed with old Vietnamese men drinking Bia Hoi. I think to join them, but there isn’t much space and I don’t want to impose. A long winding street of old buildings, old trees, and plenty of motorbikes. A few blocks away I drink beer with my demographic: backpackers, tourists, and a sprinkling of young locals. We sit on plastic stools. The police arrive in their green wool uniforms and employees scramble to de-seat people and gather up stools from the street. The stools are stacked and a number of officers confer. Maybe they count. Within moments the stools are back and within a few moments of that the police are back, stacking the stools, conferring. This time a truck hauls away some of the stools, which are replaced in the street moments later. I visit the Temple of Literature, the site of the oldest university in Vietnam, dating back to the 11th century. Confucius is the main dude. The Chinese influence is apparent, as this part of the country was under Chinese imperial tutelage for a millennium. This is another blaring disparity between the north and the south of Vietnam, where southern tribes and empires – most notably the Cham – were much more influenced by India and the island nations of Asia due to their maritime culture. My time in Hanoi is too short. My time in Vietnam is too short, but I’m out of money, tired, and jaded from travel on the backpacker trail in SE Asia. I fly to Seattle and arrive midday. I arrive in the International District to catch the bus to a friend’s. A blind man clumsily walks towards the bus stop. I ask him if he needs help and before I know it another man is leading him to the curb, telling him the No. 7 should be arriving any minute. This entry was posted on February 19, 2015 by alexjparton. It was filed under Asia, Travel, Vietnam and was tagged with asia, beer, beers, capitalism, coffee, colonialism, communism, Confucius, day in the life, hanoi, ho chi minh, museums, old town, SE Asia, socialism, temple of literature, tourism, tourists, travel, uncle ho, Vietnam.